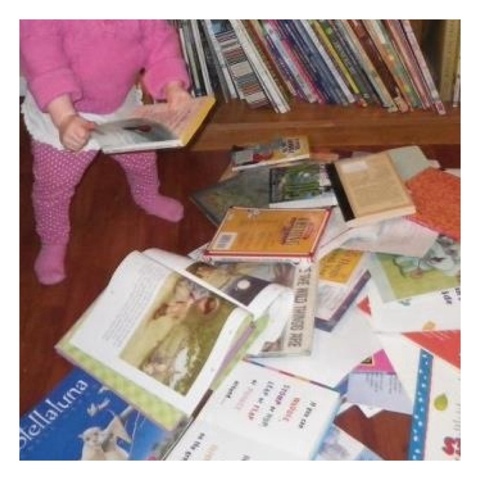 My daughter was addicted to books before her first birthday. Her most treasured pursuit is flipping the pages of her board books. From the very moment she wakes. Before her eyes even open she beseeches for her Romeo. "Booook!" She returns to her admiration all day and in the end it is difficult to put her to sleep with her incessant mewling, "book, book, book", like it's a sweet tooth that can't be satiated. She has fallen asleep with a book in her arm just like a Teddy Bear. It reminds me of the time her dad fell asleep with his arms around a measuring tape. But I think that was totally an accident. She has a bookshelf in her room that used to have a shoe shelf. I had to make her collection more accessible, and so the shoes were pushed over. She enjoys sitting in her rocking chair and flipping through her assortment of board books. Dora. Disney. Baby Einstein. Whinnie the Pooh. I love how her interest and attention has grown from the one word pages to the full stories. Books once set aside for later are added to the active array. Some she chooses occasionally and others she wants repeatedly until I know them off by heart and can recite them without effort. "Big A, little a, what begins with A? Aunt Annie's alligator. A-a-A." I bet I could tell you Dr Suess's whole Alphabet Book. I am so extremely relieved we have libraries so we can throw something new into the mix. I look forward to one day sharing some favorite classics. The Lion, The Witch and The Wardrobe by C.S. Lewis. Charlie and The Chocolate Factory. Alice's Adventure in Wonderland by Lewis Carroll. Charles Dickens. Mark Twain. J.R.R Tolkien. Oh, I'm so excited. I'll be reading with her until she kicks me out. For her second birthday I have planned to celebrate her dear infatuation. I want to have a book party. I'd love to hear of others' favorites. Ones that I have never heard of before. Expand my daughter's compilation with more than just books for which I hold a fancy. Or that I find at garage sales. I am as grateful for them as I am libraries. Her beloved pastime is quite convenient. She can contentedly look at books independently. Pointing and observing and repeating familiar words. Usually on the floor in a crazy squat that would kill my thighs. Or we can savor reading together. All snuggly close with her in my lap or in the crook of my arm. She can read books with Dad, as he adds creative twists and strange tangents that I am sure will thoroughly entertain her later. The best part about having a toddler that loves books is watching her comprehension develop. The brain is an amazing sponge. It is capable of so much growth. At an astounding rate in children. Seeing this confirms that the human mind couldn't have developed by chance but instead is a miraculous creation. With encouragement and help it is capable of more than we could imagine. Right now her brain is sorting and classifying for use the rest of her life. Seeing new things in the books each day. Items on the page she previously didn't recognize or couldn't catalogue. Sometimes she'll suddenly declare something new, like the tiny little bee next to a tree. She adores animals and anything that makes a sound, like the "beep, beep" of a truck. It is amazing watching her perceive something in books and then seeing it click when she happens upon it in real life. Then, when she goes back to that story it is even more fascinating. And existence should be fascinating. Learning should be enjoyable. Reading should be a part of everyone's life. My daughter and I are going to read about the world with our mutual love for the page (how ever that will present itself in this digital era) and then get out and explore it! Our once upon a time fairy tale truly does exist. I, of course, love this one! We love anything books! My daughter was the same, loving her books before she was even a year old... We have always read together, and she in her own way, she actually began memorizing them VERY early, so it was a little tough to know for sure, but she began reading shortly after her third birthday, and is now, at four, sailing along with it! It is amazing, watching them learn, absorbing it all... and I agree, EVERYONE should read! !